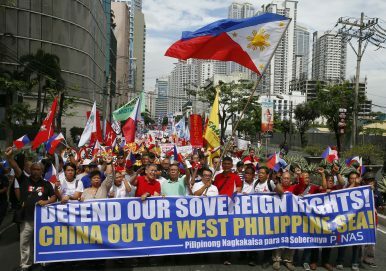 Hundreds of protesters march for a rally towards the Chinese Consulate to coincide with the country's commemoration of "Araw Ng Kagitingan" (Day of Valor) Tuesday, April 9, 2019 in suburban Makati city, east of Manila, Philippines. Known for his pro-China overtures, Duterte’s warning came as quite a shock. Since assuming power in 2016, Duterte launched a radical shift on the Philippines’ South China Sea policy — downplaying a favorable 2016 arbitration ruling, threatening to scrap joint maritime patrols with the United States, and pursuing joint oil and gas exploration — that saw Manila cozying up with Beijing, amid overlapping territorial claims. Acting out of sheer pragmatism, Duterte aimed to strike a compromise with Beijing rather than embroil the Philippines in a war against China, which it cannot win. Yet China might have crossed the line. Following the report from the Philippine Western Command on the sustained presence of 275 Chinese maritime militia vessels since January, Duterte warned: “Let us be friends, but do not touch Pag-asa Island, otherwise, things would be different,” he said. The current saga regarding Chinese behavior in the South China Sea now puts into question the legitimacy of Duterte’s conciliatory approach toward China. Amid the Duterte administration’s “pivot,” China’s hardline resolve to gradually control the contested seas persisted. In fact, Duterte’s “pivot” legitimized exaggerated Chinese claims toward the South China Sea. It signified a green light for China to fast track its reclamation activities and installation of anti-cruise ship missiles, surface-to-air missile systems, and electronic jamming equipment in the Spratly Islands, just to name a few developments. Thus, with the increasing deployment of China’s grey zone tactics and doubts over the actual economic benefits of a closer Sino-Philippine relations, the question looms: Is it time for the Philippines to re-engineer its approach toward China? The pressure is palpable for the Philippine government to retrofit its Duterte-centric approach in the South China Sea. The urgency of the matter is critical based on two developments in domestic politics, which the Duterte government has always considered peripheral in dealing with the South China Sea issue. In a recent survey conducted by the Social Weather Station (SWS), 44 percent of Filipinos, a sizable plurality, doubt the good intentions of China to the Philippines. Based on a previous poll published in November 2018, 87 percent of Filipinos stressed that the government must regain control over the shoals and islands it rightfully claims in the West Philippine Sea/South China Sea. In the same poll, 86 percent of respondents urged the government to strengthen the Philippine Navy’s capability to deter Chinese intrusion over the West Philippine Sea, while 71 percent urged the Duterte government to bring the issue to multilateral organizations such as the United Nations and the Association of Southeast Asian Nations (ASEAN). The figures are consistent yet the Duterte government continues to adopt a zero-sum game attitude, branding the Philippines ill-equipped to wage war against China, despite having pragmatic policy options to assert its right in the contested waters. Upon lodging the complaint, critics have been quick to point that no progress is likely, given China’s non-membership to the Rome statute. But beyond the viability of the case, it underpins a “shame diplomacy” tactic. It tacitly rallies international support for the Philippines and underscores that members of the domestic political sphere, represented by former bureaucrats, are devising ways to highlight the problematic aspects of the Duterte government’s appeasement of China. Following the reported swarming incident at Pag-asa Island, the Department of Foreign Affairs (DFA) released an official statement calling the presence of Chinese militias illegal. Although a diplomatic protest was not confirmed by the DFA, the statement reverberated with a loud message: China must respect Philippine sovereignty and abide by the rules of the United Nations Convention on the Law of the Sea. It still remains to be proven if Duterte’s latest warning against China will have any serious ramifications in the current government’s stance in the South China Sea. As midterm elections draw near, China is a controversial topic in electoral debates, with a staggering 89 percent of Filipinos aware of the issue. Thus, the timing of Duterte’s statement as well as recent developments regarding China in the domestic political sphere could either be serendipitous or strategic to win votes in the coming election. Known for flip-flopping, Duterte might be spotted in a campaign sortie in the coming days recalling his provocative statement and using his “it was just a joke” excuse yet again to explain controversial remarks. But one thing is certain: Duterte is now seeing the drawback of his appeasement toward China. The cracks are appearing, making the obvious clear: Not even a strongman like Duterte can prevent China from altering the status quo. The China Benham Rise Controversy: A Wake Up Call for the Philippines? The recent flashpoint could be an opportunity for Manila to take some steps that are long overdue. Have Asia’s Middle Powers Come of Age?Philippines to Deepen China Talks Despite South China Sea DifferencesObama Cancels Scheduled Meeting With Philippine President Rodrigo DuterteThe Risks of Duterte’s China and South China Sea PolicyAfter the Big South China Sea Verdict, What Will ASEAN Say?